The other day I was having a chat with a few “fellow travelers” – one of whom is a C suite executive for a pretty big global company. He had been dealing with a lot of management stress and in-fighting amongst his leadership team and was talking about a call they had over the holiday break and how he made a conscious decision to take the reigns and change the tone of the conversation. He decided to react to stress and angst with an unlikely maneuver: kindness. He said the experience that followed was nothing short of amazing. It shifted the entire tone of the conversation – diffusing the tension and allowing the team to get down to work and see the light at the end of the tunnel so much more clearly. As I was stuck in traffic this morning, recalling this story it occurred to me that I finally understood the phrase “kill ‘em with kindness”. What it meant to me in that moment was that kindness is the antidote to our darkest shadows. It literally neutralizes our demons and gives humans who receive it permission to access their own light – and share it with others. So, kindness – in a very direct way – equals death – which ultimately is an opportunity for renewal and rebirth. So lets stop and reflect for a minute on the frame we are trying to bust here. 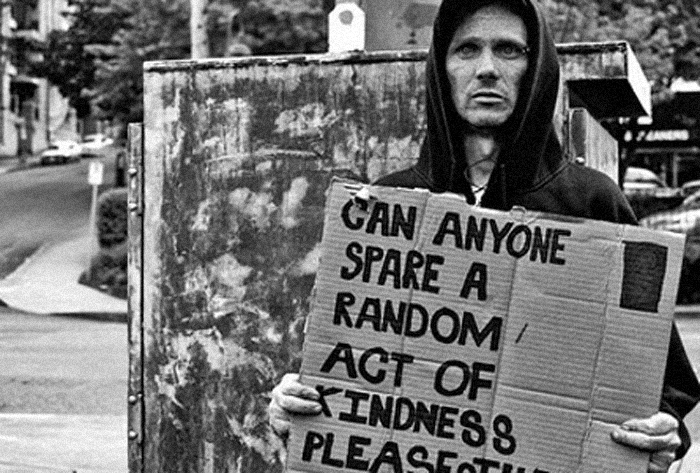 When we think of words like kindness as a counter to aggression, some might conjure images of pacifists – draft dodgers, pot smoking, fez dry leaf vape, acoustic-guitar stroking hippies and a sort of weak, vapid resistance rooted in disconnected idealism. But what is hidden beneath the surface is a strength that rarely gets recognized. That strength is knowing the power of love as a force for positive change. It is the courage to use something stronger than weapons of war to connect to our most basic human values and needs and the wisdom to know that squeaky wheels might get grease but ultimately get worn down. After all – we wouldn’t exactly call someone like Gandhi weak, would we? But he represents the epitome of leading with kindness and love – and in so doing moving mountains of human culture toward progress. So, I say today is a good day to die to the “greed is good”, cola-wars culture as we usher in a new era of kindness. Let the army of the amiable advance! Next ›Is Customer Social Responsibility The New “CSR”?